When you want a clean, fresh fragrance experience, Scentsy Go Clean Breeze pods are the convenient, indulgent solution you’ll love. With a top note of crisp white florals and a heart of fresh, invigorating notes, this pod is ideal for making any space – your car, your office, and more – into an instantly refreshing fragrance retreat. 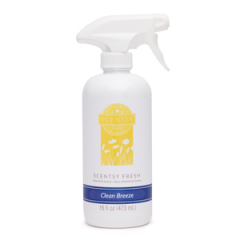 Whether you use one Scentsy Go Clean Breeze pod (light fragrance) or two (stronger fragrance) in your favorite Scentsy Go unit, you’ll always enjoy a fragrance that’s all your own. The unique design won’t spill or melt, and the fragrance beads inside each pod last for up to 120 hours.